But usually it’s a college hoops senior (most often a power forward) getting a shot with an NFL team (most often at tight end) because somebody thinks they’ve found the next Tony Gonzalez, Antonio Gates or Jimmy Graham. When the sports calendar slows down and media outlets in need of content revisit the old “Could LeBron James play in the NFL?” debate, LeBron is almost always projected as a tight end or wide receiver. In fact, the Dallas Cowboys are working with former Baylor power forward Rico Gathers right now, trying to turn him into an NFL tight end. It makes sense. Your stereotypical basketball player is tall, athletic and has a good pair of hands. A power forward with rebounding skills should be well-versed in how to go get a ball in a crowd. And given the impressive track record of PFs-turned-TEs like Gonzalez and Gates, it’s a worthy risk for a football team to take. Athletes who compete at the highest level in multiple sports aren’t brand-new either. That tradition has a long history that includes Jim Thorpe, Babe Didrikson Zaharias, Bo Jackson, Deion Sanders, Brian Jordan and Lolo Jones, among others. Robinson’s situation is a bit different. 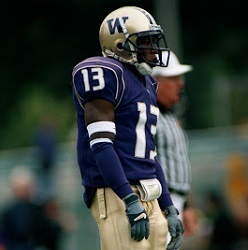 He did play football in college, but that was more than a decade ago, back when he was a two-sport freshman athlete at the University of Washington before focusing on basketball. And instead of using the typical size/athleticism/hands package to headline his application as a potential tight end, the 5-foot-9 Robinson is trying to become an NFL defensive back. The closest thing to Robinson in today’s NFL is Green Bay Packers cornerback Demetri Goodson. He played college basketball at Gonzaga for three years before transferring to Baylor to play football for three years and then going to the NFL. In two seasons with the Packers, Goodson has appeared in 22 games (including two playoff games) as a backup. 1) Basketball players are always using a form of press technique. If you watch any player in the NBA (not James Harden, sorry Houston!) they are low, squared, moving their feet on the court, exact movements when you are in on a island in the press man. 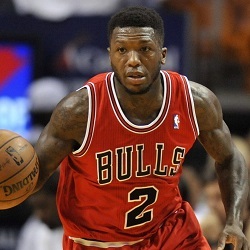 2) Having good eyes and awareness are a must playing basketball and defensive back. During the NBA playoffs, you see players trying to deny Steph Curry the ball and playing to their help. Playing in the secondary is no different! Control your eyes. Watch for double moves. Know where your safety help is. Same rules apply! 3) Timing and adjusting to the deep ball is important playing defensive back. When you go to open gym, don’t just stay behind the three point line and throw up bricks, get in the paint and rebound. Work on jumping and catching the ball at its highest point. Basketball translates well to all positions on the field, where closing angles, playing in space, and improvising are in high demand. Robinson is a long shot to make an NFL roster. He’s an even longer shot to make it with the Seahawks, who have arguably the best secondary in the league and generally prefer taller cornerbacks. Robinson is 5-9 and 32 years old and hasn’t played football in a decade. But he does, as Joseph points out, have many of the skills that should translate well from the backcourt to the defensive backfield. Take those skills, add some height and experience, and do you really think former NBA MVP Derrick Rose couldn’t have been a good defensive back? Or triple-double machine Russell Westbrook? Or Chris Paul with his cerebral style and quick hands? Or pesky defensive demon Patrick Beverly? I’d definitely like to see them try.